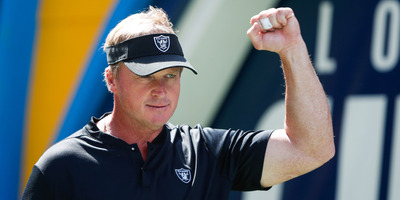 Sean M. Haffey/Getty ImagesJon Gruden is continuing his fire sale of the Raiders roster, and in the process has set Oakland up to be loaded heading into the 2019 NFL Draft. Unlike Gruden’s previous blockbuster moves, this one has received largely positive reviews, with most commentators believing Gruden got the best of Jerry Jones in the deal. Jon Gruden took yet another step towards rebuilding the Oakland Raiders from the ground up on Monday, with the team reportedly trading away former first-round pick Amari Cooper to the Dallas Cowboys in exchange for a first-round pick in the 2019 NFL Draft. It’s the latest in a series of blockbuster moves that Gruden has made since taking over as head coach of the Raiders, most notably shipping away defensive powerhouse Khalil Mack to the Chicago Bears before the start of the season. Since then, it’s been reported that there’s a “fire sale” brewing in Oakland, with Gruden looking to rebuild the team to his heart’s desires. While Gruden’s previous moves, especially his dealing of Mack, were widely criticised, he certainly looks like he got the best of Jerry Jones in his latest transaction. Cooper is a talented receiver, but has been trending downward the past two seasons, and is set to become a free agent at the end of next season. For Gruden to get a first round pick in exchange for a shaky receiver with just a year and a half left on his deal is quite a haul. The move further sets up the Raiders to be major players in the 2019 NFL Draft, as Oakland now has three first-round picks to play with next year – and depending on how the Cowboys finish the year, it’s quite possible that two of them will be in the top 15. And with the Raiders sitting at 1-5 and their season effectively over, there’s a chance the Gruden makes a few more deals before the deadline to stockpile even more draft picks for the coming seasons. Across Twitter, people seemed in agreement that Gruden and the Raiders had gotten the best of the deal. If Amari Cooper is worth a first-round selection, then Patrick Peterson should require a draft equivalent of Powerball to acquire. Amari Cooper has 22 receptions, 280 receiving yards and a TD this season. #Cowboys gave up a first to get him. Josh Gordon has 14 receptions, 241 yards and 2 TDs this season. #Patriots gave up a 5th to get him. A first-rounder for Amari Cooper. The Cowboys are your friend who pays $179 for a T-shirt that they could have bought at Target for $12. When the Raiders agreed to bring Gruden in as their head coach on a 10-year deal, the team already seemed poised for success – just one year removed from a 12-4 season that was derailed by a freak injury to their quarterback, and featuring some of the talented players in the league. Now, the Raiders are Gruden’s team, and their future fortunes will depend largely on how the team decides to use their assets at the 2019 Draft.